C+S > C+S wins BIGMAT National Award 2017! C+S wins BIGMAT National Award 2017! On November 24th C+S were awarded of the NATIONAL BIGMAT AWARD 2017! 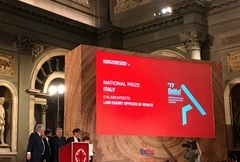 The awarded ceremony took place in Palazzo Vecchio in Florence. Carlo Cappai and his son Tobia attended the ceremony. The panel chose this project " because of its seamless integration within a complex urban setting, as it successfully fuses the traditional old warehouse styling with the stereometric volume of the multi-storey car park. Thanks to its slender and lithe design and its pitched roof profile, the work is a perfect grafting within its environment. The use of just one material, both for the roof and the interior cladding of the walls, makes the building all the more iconic and abstract, while giving it a timeless quality."